Giochino Rossini: A Research and Information Guide is designed as a tool for those beginning to study the life and works of Gioachino Rossini as well as for those who wish to explore beyond the established biographies and commentaries. The first edition was published in 2001, and represented a survey of some 878 publications relating to the composer’s life and works. 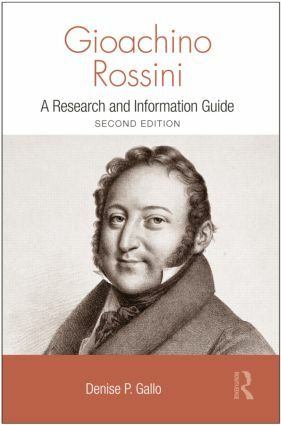 The second edition is revised and updated to include the more than 150 books and articles written in the field of Rossini studies since then. Contents range from sources published in the early decades of the nineteenth century to works currently in progress. General subject areas include Rossini's biography, historical and analytical studies of his operatic and non-operatic compositions, his personal and professional associations, and the reassessment of his role in the development of nineteenth-century music.